The laboratory ─ more than most clinical areas ─ relies on its reporting tools (both internal and external) to meet operational and regulatory expectations. While LIS reporting has improved significantly over the years, most systems are still walled off from the rest of the medical record ─ an inherent limitation that puts a drag on both reporting capability and fast access to information. Enter Epic’s Beaker LIS. By contrast to most, a properly-configured Beaker report will help you achieve full integration with the EHR and all the data contained within it ─ leading to increased operational efficiencies and improved patient care. Below, I delve into the benefits of properly-configured Beaker LIS reports, highlighting some challenges to plan for when optimizing your reports and five ways to use the reports to boost lab efficiency and improve patient care at your organization. As I mentioned above, when your Beaker LIS reports are operating at peak performance, your lab efficiency will also increase. For example, your teams will have access to clear, helpful information to aid their decision-making. The full EHR integration will also enable your teams to operate faster because they'll no longer be dealing with the slow-downs of navigating a siloed system. In addition, an LIS with full EHR integration will allow your lab teams to create entirely new types of reports that can be custom-fit for different users with different data needs. When properly configured, Beaker’s reporting tools can unlock huge efficiency gains in the KPIs that matter most to lab teams while providing the kinds of actionable data that impact patient care. Before I address the why and how, it’s important to touch on the challenges that often prevent organizations from using LIS reporting to its full potential in the first place. Establishing genuinely robust reports typically takes longer than most organizations expect. Besides the basic reports that need to be set up from day one for licensing and accreditation purposes, the list of requests for management and other common types of reporting is often pushed to well after go-live. Competing priorities and the after-the-fact nature of the task (sometimes 30, 90, or 365 days after a result has actually been “reported”) often lead to most reports getting pushed all the way to optimization ─ a huge missed opportunity for enabling operational lab efficiency from the kickoff of an install. When many people hear “reporting,” operational or management reports immediately come to mind. But tools like Beaker enable reporting to do its broader job: helping everyone who interfaces with the system be more efficient and effective in their roles by arming them with the data they need when they need it most. It's important to address these or any other challenges that may come up while you work to enhance your LIS reports. And as you work through these challenges, try to keep your end goal in mind. On that note, here are five ways that properly-configured Beaker reports can allow your labs to operate faster and provide your users with clear, helpful information for better decision-making. In the past, the way these systems were built made it tough, if not impossible, to realize reporting’s full potential both in and out of the lab. Information from an integrated LIS had to be extracted via reporting before it could be used. Today, that functionality is built directly into the Beaker activities, allowing data that flows into the system to quickly flow right back out to clinicians and labs through user-friendly dashboards and other reporting features tailored to different users with different needs. Within Epic itself, there are multiple levels of reporting that can greatly assist users as they provide patient care. Beaker application views (such as the Outstanding List, Expected Receiving, and the Case Prep Worklist) should be customized to display appropriate information for users. For example, no matter if your users work in a single section or multiple sections of the Outstanding List views, you can provide them with a filterable one-stop-shop for outstanding specimens to improve their workflow efficiency. By simply displaying the appropriate columns within each view, users feel a lot less overwhelmed by what’s appearing on the screen and less frustrated by the new list views. Your technicians also have the ability to color code or display icons based on specific needs, providing them with more tailored information at a glance. You can replace the report panes in Beaker activities with reports that are customized for your organization. The report views can be set up to display information regarding a specimen or case. Or, much like Result Entry, the report view can provide more of a total picture view of a patient’s health and history for pathologists. These reports can be designed to pull in appropriate information and wrenched in by users who will be adopting them. For example, pathologists may want several views to make sure they are getting to the information needed for a patient, including a gynecological history (previous paps, microbiology testing, and woman’s health history), patient history (surgeries, medications, social history, notes, and upcoming appointments), or clinical history (with recent CBC and culture results). Each of these report views enable pathologists to access pertinent information from within their resulting workflow. In addition to providing more data points to inform care-related decisions, this reduces the number of clicks back out to the patient’s chart. Simple efficiencies like this typically add up to significant time savings for users. Updating Chart Review to fit the needs of your organization ─ such as displaying appropriate columns or adding custom print groups to the report view (like specimen tracking or ensuring critical communication documentation is easily accessible) ─ can improve satisfaction not only for providers but also the lab. These efficiencies help reduce fielded calls by giving everyone access to the same information. While most providers will initially look at results in Results Review or IB, it's important that your Chart Review is designed to display appropriate information in an easily consumable and searchable format. The columns and report view are extremely vital to how a user interacts with Chart Review. Make sure to include the source/type so that your pathology reports are easier to find. In addition, double check that lab results display at the top of the report view, making appropriate order/resulting information easily accessible and not buried three clicks deep. Management or long-term reporting can be handled in a variety of ways depending on the time frame and information being requested. Finding the right tool for the information requested is vital, and your reporting team should ask whether Reporting Workbench, Clarity, EDW, or SlicerDicer is the best tool for the specific task at hand. Do you need real-time data or can this be historical? How often will you be querying for this data? What information do you need in your report? How will this report be used? Reports may range from collection compliance to turnaround times, pulling specific orders placed in the last week to querying the system for all pathology cases of a specific source in the last five years. Working through each request for the root need and information required is an important part of defining use of traditional reporting tools. The key is to make sure that the front-facing tool and output is a usable, consumable self-service tool. By allowing users access and setting them up with the appropriate tools, lab management and pathologists take on more ownership of the system and the data entered into it. Dashboards are often underutilized and almost never fully optimized for day one of go-live. These reporting tools are customizable by job role and provide a great one-stop shop for consuming and summarizing reporting content. Different users want to see different statistics and information and have the ability to access quick links to heavily-used activities. Dashboard views can also vary depending on role. If users have crossover between lab and pathology, they may want different views to monitor information specific to their role. For example, a pathologist may use her dashboard as a place to review cases she’s currently assigned to, QA that needs to be completed, or to view follow-ups. She may also use her dashboard to run favorite reports for a more high-level review. A management dashboard will have a completely different setup than a tech dashboard. One is much more focused on delivering analytics and oversight, while the other provides one single location to view heavily used activities, announcements, or to monitor day-to-day testing. Dashboards should be leveraged as a launchpad, allowing a user to have a single source of heavily used activities, information, and pertinent tips/tricks broadcast to them. Many times, management has seen these dashboards in use at labs they’ve toured or in sales demonstrations and are eager to implement this new functionality. The decrease in clicks and typing is excellent for end-user satisfaction. Dashboards’ easy graphical visuals and drill-down capabilities let users find and use data without having to do a lot of digging, making them very helpful for management when conducting quick lab metric reviews. Properly-configured reporting tools, when combined with the training required to use them to their full potential, enable users to take more ownership of their system while giving lab managers a way to highlight successes and shine a light on areas for improvement. The return on proper reporting setup is realized in the usefulness of the data those reports provide. With the right report, a lab may uncover a critically important change to a workflow or see that certain staffing updates are needed to support current workloads. Data may also shine a light on problem areas, such as upticks in corrected reports, a spike in cancelled testing, or unusually high levels of discrepancies in correlation. By highlighting this information, the lab has the opportunity to dig in further to figure out root causes: is it build, is it staff, or is it something outside the lab? Reporting tools have a high impact on lab management and pathologist satisfaction. Empowering users with good tools and useable dashboards enables them to partner with ─ as opposed to be dependent on ─ the Beaker IT team. Are you interested in learning additional ways your organization can enhance your use of Beaker and reports? Schedule a meeting, and we can discuss the best approach for helping you achieve your reporting goals. Mallory Powers is a manager of Optimization Solutions at Nordic, leading development and execution of strategic solutions. She works with client partners to make their people, processes, and systems more efficient and supportive of their organizational goals. 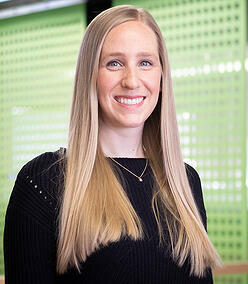 Mallory brings nine years of healthcare experience, specifically in the laboratory information system field, to her clients, helping to maximize system usability and improve patient care.